The ovary produces an egg by producing a small cyst (often called a follicle). When the cyst bursts the egg pops out. Sometimes the cyst does not burst and goes on to get bigger and bigger, causing problems with pain and bleeding. There are other benign and cancerous cysts that can also cause problems. Your doctor can arrange an ultrasound scan to check the status of your ovaries. An ultrasound scan uses echoes from a transducer (probe) to create an ultrasound picture. By using many echo pulses many times a second and processing the information through a powerful computer we can produce a real time image of internal organs. With ultrasound the nearer you are to the object you want to examine, the better the quality of the picture that can be obtained. By using a transvaginal probe we can visualise the uterus and ovaries in great detail. 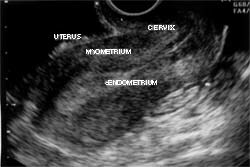 Above: Ultrasound image of a normal uterus, with pointers to myometrium and endometrium. This allows us to diagnose problems in early pregnancy, including the investigation of threatened miscarriage and ectopic pregnancy. 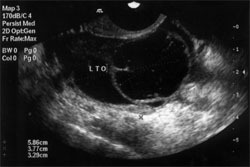 Above: Ultrasound image of an ovarian cyst (simple). Simple or functional ovarian cysts should have no echoes inside. Complex cysts (see picture 6 next page) are commonly secondary to endometriosis (see painandbleeding), teratomas or dermoids. Endometrial cancer is also a cause, particularly in older women. Further investigations, usually including laparoscopic removal of the cyst is recommended. Pelvic infection can cause fluid collection and swollen, damaged tubes (hydrosalpinx), which can be seen with an ultrasound scan. It is important to remember that ultrasound can spot when all is not right in the pelvis; it is only when the surgeon operates or reviews the histology (microscopic examination of tissues removed) that we can be certain about the problem that a woman may have. 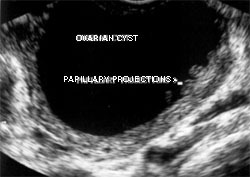 Above: Ultrasound image of ‘suspicous cyst with papillary projections’.